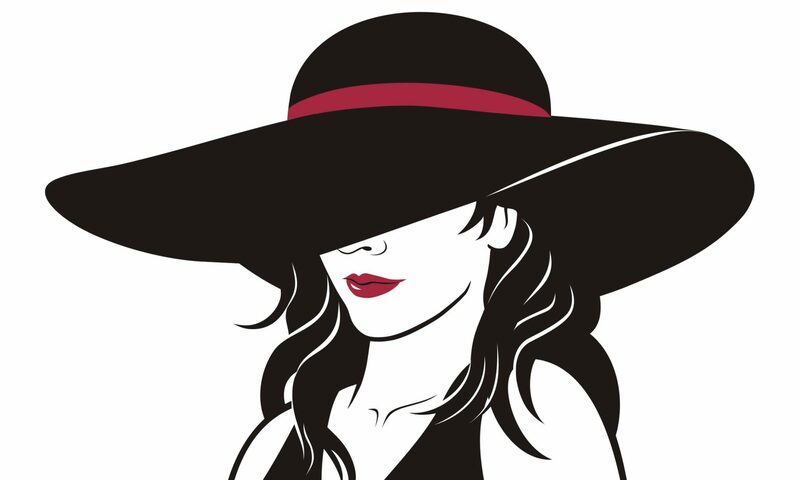 I first heard of Ivana Raca when I dined on the back patio of her restaurant, Raca Café and Bar (now closed). She was a young gun who’d quickly risen through the ranks under the tutelage of Mark McEwan — becoming his first-ever female saucier. A few years later, I saw her again as a fierce contestant on Top Chef Canadaand was impressed by her skill and tenacity. 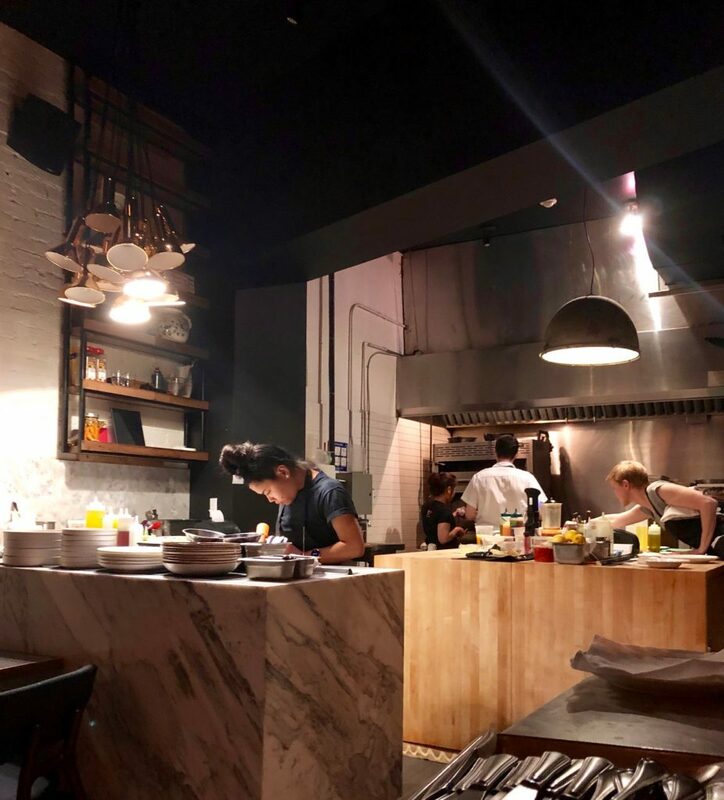 She didn’t stop there — in 2018, she and the former co-host of Top Chef Canada, Brad Smith, opened Resto Boemo in Assembly Chef’s Hall. Today, she’s also a partner at an Italian restaurant, Ufficio, that specializes in seafood. 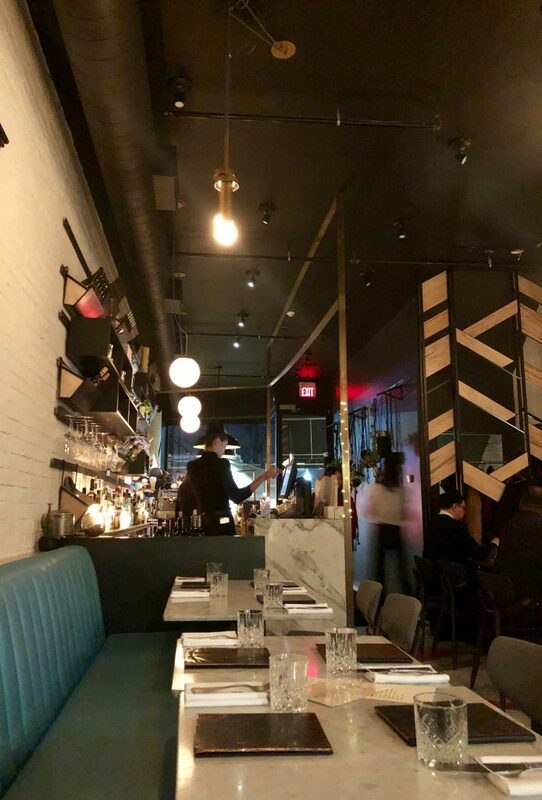 I was invited to a Friday night dinner at Ufficio, located on Dundas West. Our party of troissettled into the spacious semicircle banquette with a prime view of the open-plan cuisine. Design elements, such as the aquamarine banquettes, evoked a nautical theme, but not in a kitschy way. Other decor was quite literal (etun peutacky) — for example the giant fishing net that also served as the primary art installation on the main wall. Design mishaps, however, were forgiven by the genuine hospitality. Our server didn’t hesitate to rhyme off her favourite dishes and daily specials, proceeding to explain each one in mouth-watering detail. She engaged in witty banter, showcasing her amiable and quirky personality. 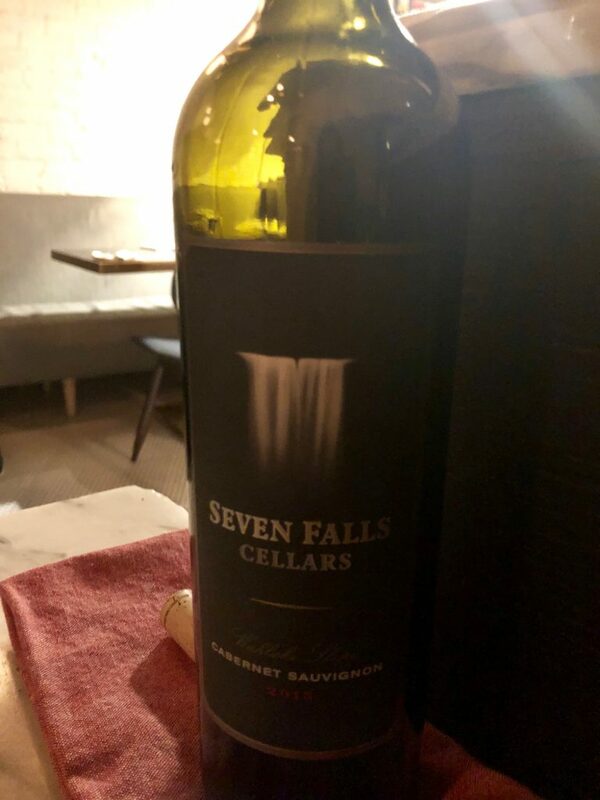 From the wine list, we ordered a bottle of Seven Falls Cellars Cabernet Sauvignon (2015) from Washington state. Hailing from this new region, the wine was silky and rich with dark berry notes. And, the already-good wine improved throughout our meal. Italian influences were woven into the menu with plenty of house-made pastas and pescatarian options to choose from. There was also a separate vegan menu, but that wasn’t our thing. 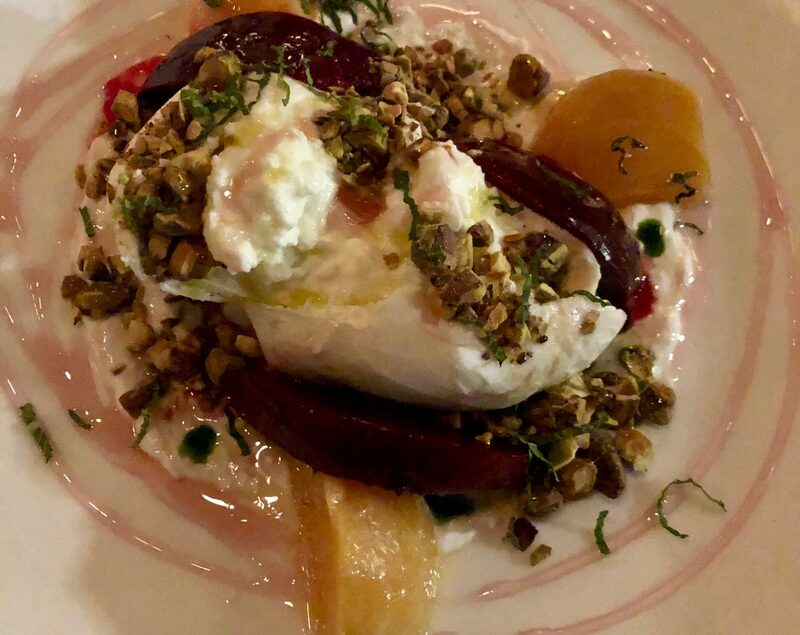 To start, we opted for the Ontario burrata ($17) — silky soft cheese laid over pistachio purée and accompanied by sweet and tart pickled beets, horseradish crème fraîche, crunchy candied pistachios and fresh mint. Presentation was top notch. The ring of Agrodolce, a sweet and sour sauce, around the mound of cheese tied everything together. The dish was reminiscent of former consulting chef Craig Harding’s various burrata concoctions at Campagnolo and La Palma (see my review of La Palma here). 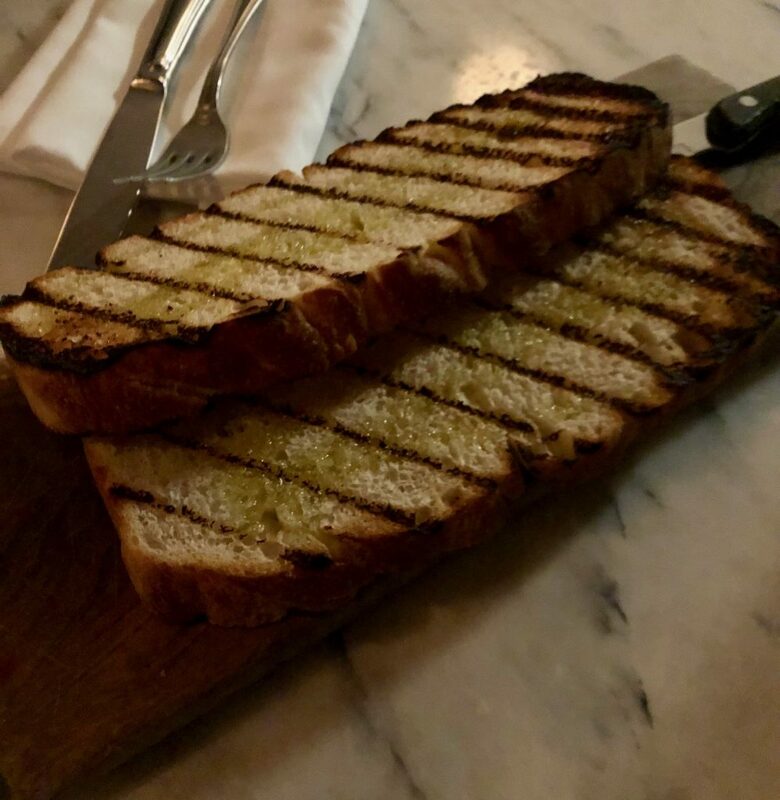 We also ordered some rosemary focaccia ($5) — a generous portion of toasted bread to spread the luscious mixture on; however, the burrata was deliciously satisfying avec ou sans du pain. 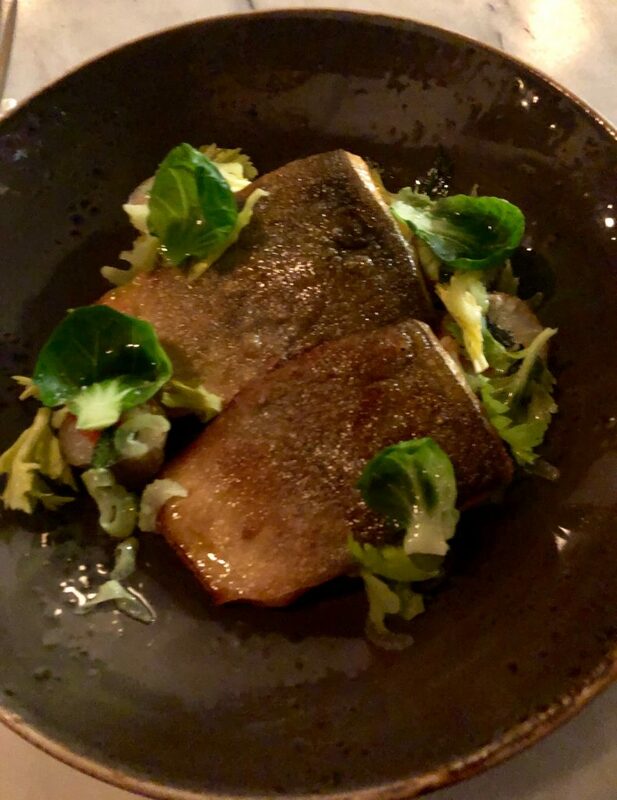 The poisson du jourwas Arctic char ($32). Two meaty fillets were served skin-side up on celeriac purée with roasted sunchokes around the plate. While I would have liked a crisper skin, it was a generous price-to-portion ratio. The sunchokes struck a flavorful balance between earthy and slightly sweet. Their tender flesh was encased around a flaky skin, and when dipped into the celeriac purée, it was simply délicieux. 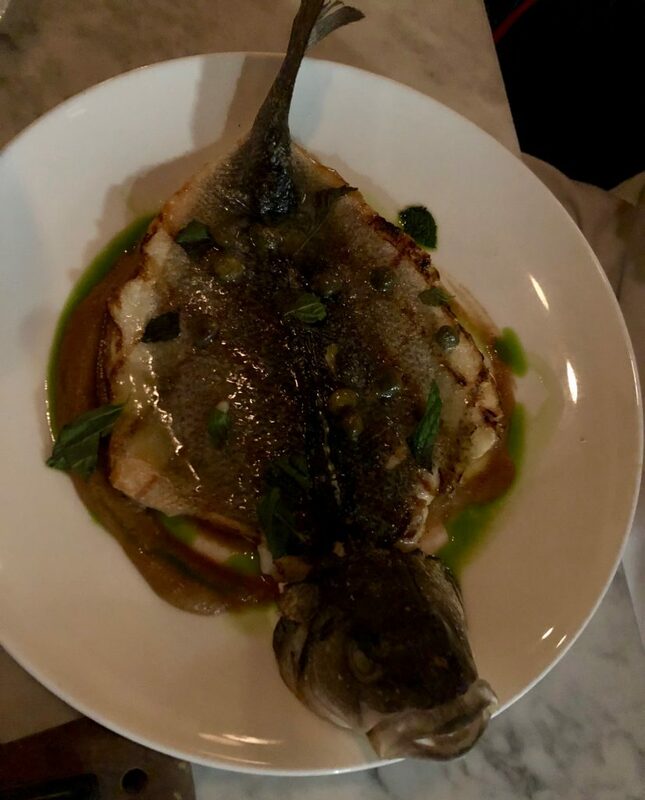 The Branzino alla griglia ($35) was small fish served whole. Simple flavours from the roasted onion purée, lemon-caper butter and mint played well with the sweet flaky fish. While there was nothing extraordinaireabout this dish, I enjoyed the slight charred flavor from being grilled on an open flame. It was reminiscent of coastal Italian cuisine — pin bones included! There was an opportunity to explore one of four types of pasta, ranging from Agnolotto ai funghi ($25) to bucatini ($24). 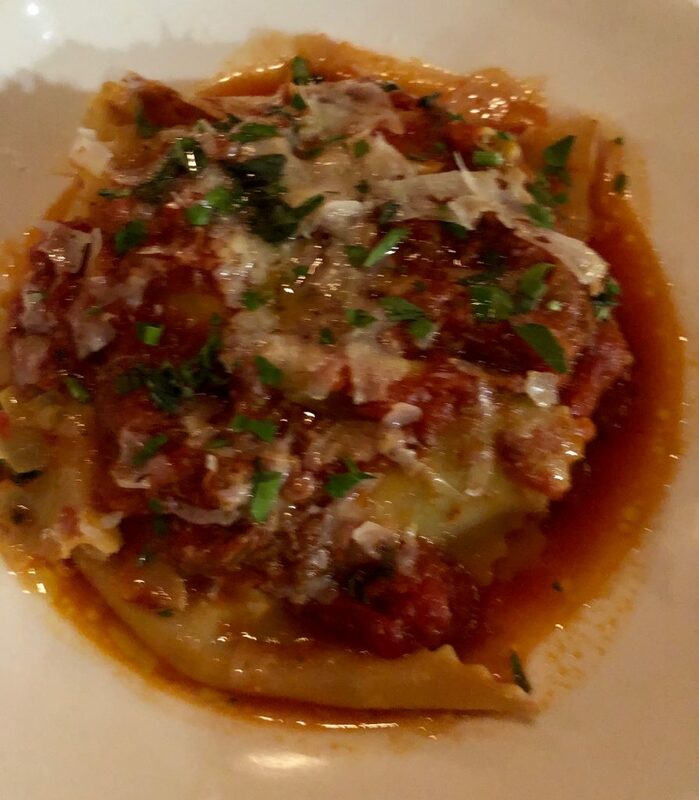 Our selection, pappardelle di ragú di manzo ($27), was not a knockout. From the braised beef ragú to the pomodoro sauce, everything was in dire need of salt and herbs. Overall, the bland noodles were begging for some sharpness from some more Parmesan. When we placed our orders, we originally ordered a side of cavolfiore ($14) pour partager. We were so engrossed in conversation that we didn’t realize until after our entrees were finished that the cauliflower never came. 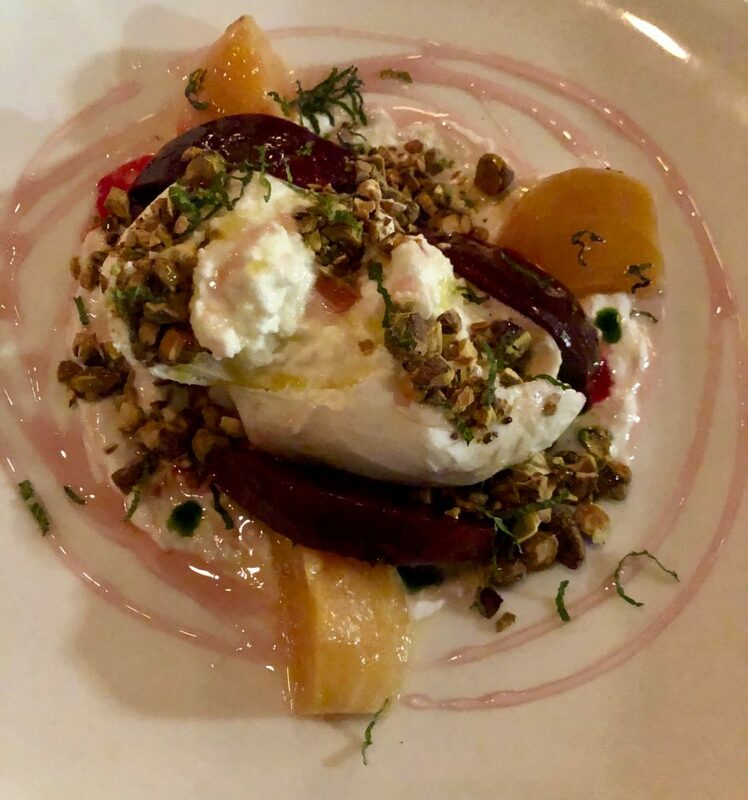 When we alerted the server, she apologized profusely and joked that it would come as a “healthy dessert.” It was a beautiful dish when it arrived (finalement!). Perfectly roasted cauliflower florets still had a slight crunch. 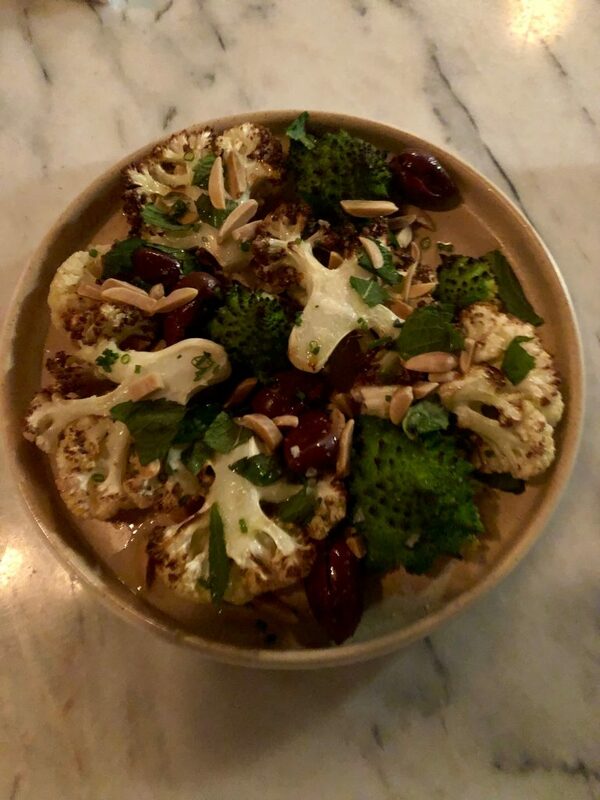 Romanesco, toasted almonds and olives injected some flavor to the bland vegetable. What I enjoyed most about Ufficio, however, was not at all food related — it all came down to the overall feeling. It was female-forward, with a 95% female kitchen and serving staff. In an industry that is typically male-dominated, it was refreshing to see. Although prices were a bit steep, the ambiance and service helped enhance the overall experience. And the plates Ufficio produced — while no dish quite reached the heights of the burrata — were pleins de saveur. La prochaine fois that you’re in Dundas West, visit Ufficio for the burrata and a drink.